Before I go to the Netherlands, I've got a really nice polish to show you. I bought this at the same time as Festival, the flakie I posted yesterday, from Llarowe. Speciallita HITS is a Brazillian company that have some amazing polishes. I posted a picture of their Phenomena collection on Tuesday and I really can't wait to get it!!! 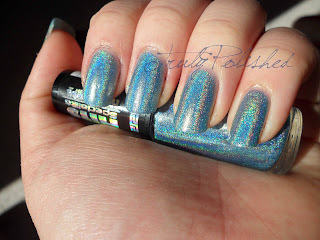 No Olimpo is a pale blue linear holographic polish. It's so sheer so I had to use 4 coats, but once I did, it looked amazing. It's blindingly holographic in the sun! I wore it for 3 days with no chips and I only took it off last night because I'd bought 8 new polishes that I couldn't wait to try out! 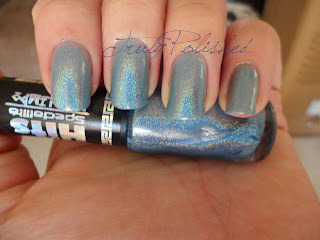 In the photos below I'm wearing four coats with Nº7's Stay Perfect Fast Dry top coat. I didn't use Seche Vite because as much as I love the glass like finish, it doesn't last well on me and usually ends up peeling after a day. 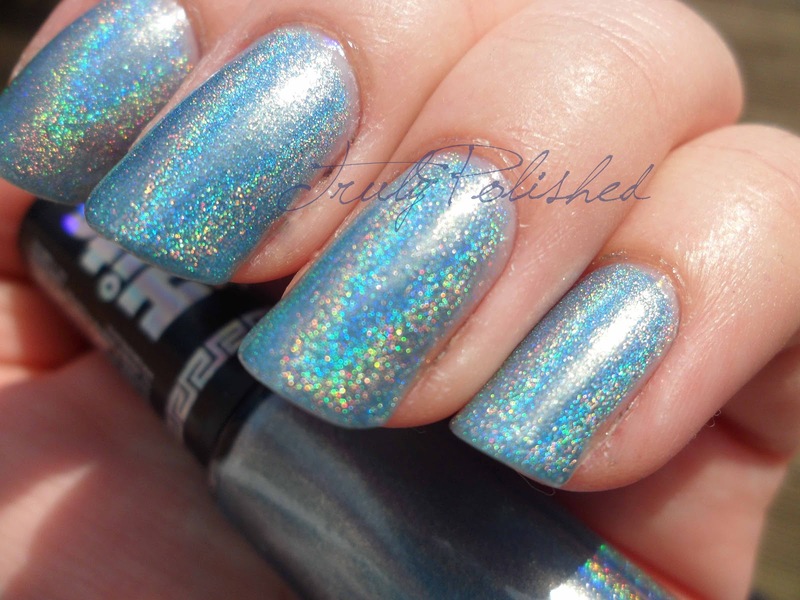 Look at that holo in the sunlight! One thing worth mentioning is that the HITS polishes aren't 3-free as they contain formaldehyde. I always paint my nails in a well ventilated area so I don't mind, but if you paint yours in a closed room, it might be an idea to open a window. I think you'll agree this is an lovely polish! If you like it as much as I do, you can find it here at Llarowe where it costs $10. I love this polish so much that I bought Hefesto and Apolo too. I'm waiting to receive them, but as soon as I do, I'll swatch and post them! OMG I love looking at swatches by Hits & this 1 did not disappoint! It's gorgeous!